Industrial Internet of Things (IIoT) has created a fantastic enabler for optimising how enterprises operate, only comparable with the introduction of the concept of business process at the beginning of the 20th Century. With IIoT solutions implemented, quick winners are not only gaining in operational efficiencies (e.g. visibility, agility), but the consequential improvement in productivity by reduction in mean time to repair (MTTR) and warehousing for parts, but also helping businesses generate even more positive margins by enabling a “Just in Time” approach of service and a cost reduction. From the two questions presented, the platform strategy seems to be receiving more coverage from the internet community and, hence the appeal to discover more details on the competitive strategy. How can COMPANY satisfy and maintain their current customer base? What are the strategic boundary choices and partnerships for COMPANY? How could COMPANY align the organisation’s design for an IIoT market? From its inception, it has been visible that as IIoT expands, there is a greater role for software than for the traditional hardware based solutions used specifically at an industrial level. Also, advances in Big Data and Machine Learning reflect the need of having an Artificial Intelligence (A.I.) layer built into IIoT solutions. COMPANY’s overall mission fits accordingly with these two specific findings. Keep a close eye on creating or partnering with differentiating complements, software (like A.I.) and hardware (sensors). As of the 1st of August 2017, Google returned over 38.3M results when you entered the search term “Industrial Internet of Things”, if you could read each link in a minute, it would take 72 years to consume all the information that has been generated for a term that is only 13 years old (although the concept first mention found was in Scientific American, similar concepts have existed since the dawn of computers). Even though it might be small in comparison with other topics and technologies in terms of available links, the potential impact is more significant for businesses than most others. As Jamie Carter summarises the potential impact of IIoT in the very title of his article “Forget smart fridges: the Industrial Internet of Things is the real revolution”, where Bill Morelli from IHS gives us the very essence of where are the imperatives for businesses in IIoT: “Industrial IoT is strongly focused on improving the efficiency, safety, and productivity of operations with a focus on return on investment”. The aim of this report is to cover COMPANY’s potential best competitive strategy to succeed in the IIoT market. The approach is to focus on a specific industry sector and organisational design that allows COMPANY to gradually expand in (functional) depth and expand in breath across other industries via an increment in product boundaries through versioning and featuring. From the early research at the beginning of the project, it was clear that answering the question around competitive strategy was a less explored subject, providing the potential for a more interesting and diverse report. 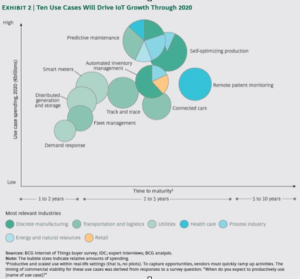 With the Boston Consulting Group predicting (BCG) an the overall market of €250B for IoT and a potential 50% of that in the “Industrial” segment, one of the biggest challenges for COMPANY is that 40% of today’s IoT customers prefer to use traditional and well-established software companies for their solutions (companies like General Electric and Siemens), with the area of Predictive maintenance taking one of the largest chunks of spending (see BCG’s “Exhibit 2”). This is a huge market opportunity for COMPANY, but also has disadvantages, considering what is mentioned above about preference of “well-established companies”. If BCG’s estimates are correct, a market that will have matured between 2 to 5 years, and have a high use-case spending. Establish a strong partnership model with end-user service providers (e.g. 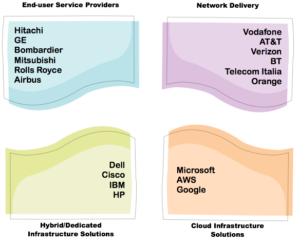 manufacturers), network delivery(which provide a “vanilla” infrastructure for IoT), hybrid and dedicated infrastructure solutions (a multi-domestic delivery strategy, for countries or industries that have specific regulations), and public cloud infrastructure solutions (a global strategy, for a more flexible delivery model). I have read and collected some of the most relevant reports, studies and analysts’ articles in order to approach this report with the maximum amount of information available on the topic. 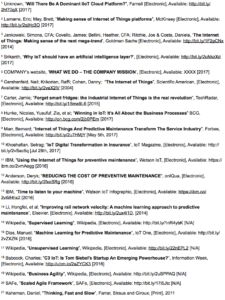 Additionally, I have searched for other publications (Forbes, etc) that have created relevant articles related to IIoT and more specifically in the area of predictive maintenance. All documents were reviewed and ranked in order of relevance and content that could be used to generate this report. A SWOT (Strengths/Weaknesses/Opportunities/Threats) was then extracted from the different relevant sources in order to provide a succinct analysis of the work executed. Unfortunately, interviews were not possible. Other predictive maintenance competitors, like ServiceMax, are already stating “on its first-year performance, customers have reported benefits after switching to a connected strategy across productivity, efficiency, growth, revenue, customer experience and compliance.” which is an excellent reading of the potential impact of products targeting predictive maintenance done right. Other sources highlight the impact of IoT in the insurance industry, since predictive maintenance is about reducing risk and insurance is about mitigating risk, IIoT provides users and insurers with better understanding of all aspects of the lifecycle of the elements being monitored (e.g. when/how/what/why/who) which allows users to push for lower premiums, proven they correctly implement the IIoT predictive maintenance solution. But the key objective across different reports is consistent about IIoT in general, and predictive maintenance specifically (8): Understand how the sensor data will be used, with a direct link on reducing costs or increase of revenue. On the other hand, the main challenge for providers is the move up and down the (technology) stack, as the ecosystem is more complex than ever before. Reports from other competitors highlight that rail providers are amongst those that will benefit from predictive maintenance: “The oil viscosity in a locomotive with a certain component configuration is consistently higher than other locomotives.” An analysis of underperforming components can help drive improvements in other faulty configurations and reduce the number of failures across the fleet. IIoT enables users to dive, dig and juggle new information in ways never seen before. 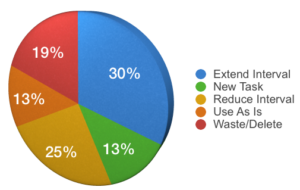 80 % of Preventive Maintenance costs are spent on activities with a frequency 30 days or less. In this report, we also find that the extent of the over-maintaining problem and shows the effectiveness of a review program in addressing the Preventive Maintenance activities. Until the advent of IIoT and cognitive analytics, predictive maintenance was a fixed-slot/fixed-scheduled activity that worked based on a recommended practice from the suppliers of the components, machines or solutions, reliant heavily on human resources for its execution. Before, organisations had problems of under-maintenance (increasing risk of failure, down time and insurance) or over-maintenance (increasing costs unnecessary); IIoT has now enabled organisations to deliver effectively on what is called “Lean Predictive Maintenance” – all efforts are executed only when they will produce the right amount of impact. 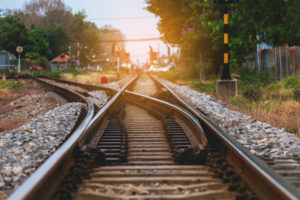 IIoT solutions generate massive amounts of data (“big data”) to be processed (“analytics”) or automatically interpreted (“machine learning/Artificial Intelligence”), the subject has even generated research in the area of rail network improvement in order to accommodate increased service demand and load, without compromises in safety. As mentioned already, the pillar supporting the business attractiveness of IIoT and the massive amounts of data it generates is the Machine Learning/Artificial Intelligence to provide Data Analytics either in a supervised or unsupervised way. With unsupervised learning, predictive maintenance now can extract patterns that have not been seen before, effectively developing a 6th sense – finding relationships and patterns in the data that have not been spotted before. IIoT based Predictive Maintenance solutions are one of the most significant applications merging “industrial revolution” with “technology revolution”. Based on the research, it is clear that IIoT and specifically Predictive Maintenance have the capability of impact significantly operations and cash flow for organisations from multiple angles in the improvement of performance of the organisation. Analogous to software development, predictive maintenance introduces the concept of “Just in Time” and opens the door to the creation of a more agile and dynamic organisation. 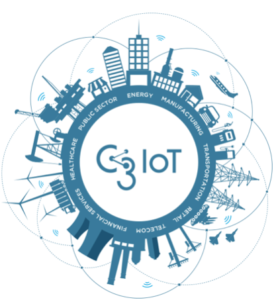 For example, C3IoT has said in 2016 that they have already 70 million sensors deployed and connected to their platform. Covering 8 sectors/verticals (see image), but also covering further operational services (predictive maintenance, inventory optimisation, etc) whilst using Artificial Intelligence to navigate through the vast amounts of data generated by all the sensors and services. as a result from the above, reduce costs from development and marketing. Since IIoT relies heavily on software, COMPANY can rely on frameworks such as SAFe (Scaled Agile Framework) to enable an agile delivery team that churns horizontal and vertical features and improvements at the speed of digital. Agile methodologies have advanced significantly, now covering aspects such as financial planning, helping businesses mitigate the risk of development whilst delivering objectives at a much faster pace. Also frameworks such as SAFe have multiple layers that enable enterprises adopt and grow with them without fundamentally changing the way of work at the lower layers of the organisation. All reports and articles found point at the heavy (if not “fundamental”) use of Machine Learning/Artificial Intelligence as part of the core offering to extract the maximum amount of value out of IIoT and specifically out of predictive maintenance. COMPANY’s value proposition (“COMPANY offers industrial IoT solutions combining smart sensors, data fusion and AI-based analytics to increase asset availability and optimize maintenance planning.”) makes an excellent job highlighting the combination of IIoT and Artificial Intelligence to allow customers the extraction of maximum value out of the offering. 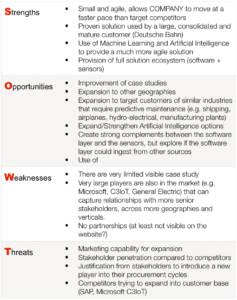 Based on BCG’s report (8), the market is sufficiently large to accommodate lots of companies and varieties of services across multiple verticals and geographies, so as chances of IIoT oligarchy are diminished, opportunities for COMPANY’s expansion and consolidation appear to be everywhere at this point in time. This report presents a high-level SWOT analysis based on what is publicly available on COMPANY’s website, reports and articles, and the recommendations will be based on the opportunities listed in that table. Artificial Intelligence: in today’s technology markets, Artificial Intelligence is the core association between operations and savings for organisations. A capable, cognitive reach, low biased (for supervised learning) and capable of unsupervised learning platform is important to provide the automated data analytics customers want and extract maximum value of the sensor data generated. Geographical Expansion: one of the biggest challenges is that of expansion geographically, this could be achieved via partnerships with manufacturers (in the industries where COMPANY operates) or vendors (in the markets where COMPANY wants to operate). A platform that can operate in multiple scenarios (cloud / hybrid / on-premise) could allow COMPANY to penetrate geographies at a much faster pace than competitors. Of importance is the knowledge of local regulations and industry standard variations that might require extra development of the solutions before entering the market. Industry expansion: echoing geographical expansion, targeting different verticals that are (at first) closely related to current verticals and then further expand into other (less related) industries is a strategy worth pursuing, either independently (for closely related industries) and through partnerships (for less relatable industries that require more knowledge or relationships). Remembering that “What you see is all there is”, it is important to remember that predictive maintenance is a relatively small niche in the Business to Business space, with 301K search queries for “maintenance” in the US (the largest! ), 40.5K search queries for “Industrie 4.0” in Germany, it is important for COMPANY to position in these results on page 1 or 2, working with Analysts and establishing partners, work into establishing as a recognised brand in the field. Continuous improvement of the product and services will guarantee the ability to maintain and expand the customer base, a light and agile organisation will also enable keeping flexibility whilst responding to internal and external pressures. IIoT and predictive maintenance are business areas with lots of potential for development and expansion, it is also an area where implementation of next generation advances in Artificial Intelligence and telecommunications (e.g. 5G, Li-Fi or Super Wi-Fi) to allow enterprises to achieve new savings on their operational budgets in the most efficient way. Exploration of other technologies (like Blockchain) and security aspects that are relevant to any enterprise were beyond the scope of this analysis, but worth researching and keeping at the forefront of product capabilities.